A truly memorable and beautiful film, in both story and style this film excels in bringing back a nostalgic feel for the 1960’s and childhood romance. The premise for Moonrise Kingdom, quirky director Wes Anderson’s 7th feature, is simple enough. An imaginary Island in 1965, two dysfunctional children, one an orphan child scout, Sam (Jared Gilman) and the other a troubled girl, Suzy (Kara Hayward) from a semi- broken home, fall in love and go on the run from adults who seem to be having much less fun than they are. 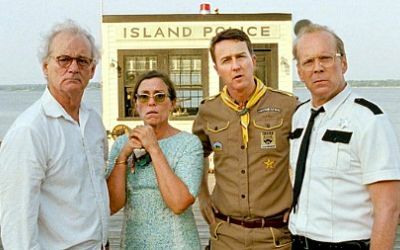 The film features frequent Andersonian collaborator Bill Murray after the children as well as a perfectly cast Bruce Willis and the good hearted sheriff of the make believe island of New Penzance. The film has been lauded at Cannes, getting nominated for it’s highest award, and is being called one of the best films of the year. The story of the film is told from both the children’s point of view who are in constant whimsy and that of the adults pursuing them who are getting more and more troubled, the film is never boring thanks to this technique. The films strength does not lie in its simple plot that unarguably lacks the depth of Anderson’s other work (and quite rightly for a film about childhood romance) but in its brilliantly written characters, settings and dialogue. Every character in this film is enjoyable to some extent; whether it is the psychologically damaged young lovers, a very dedicated camp master, a father like sheriff figure (Bruce Willis) and an emotionally starved husband (Bill Murray) all these characters have brilliant aspects that the audience get completely immersed in. Anderson has written a snappy and witty script here also which more than delivers on the laughs, and he is at his directorial best in terms of the technical side of the film. The visual aspects of the film are fantastic, with long static shots of dozens of uniformed campers sprawling in intricate backdrops that in a quirky somewhat disturbing way mirror Stanley Kubrick’s Full Metal Jacket. Every set, every costume and every location is filled with immaculate detail and colour, this film is really a visual feast. Anderson directs actors with great skill here as he weaves together unknown faces such as Jared Gilman and Kara Hayward as well as frequenters of Anderson films such as Bill Murray and Jason Schwartzman in a perfect way which makes no actor feel unwelcome. The greatest piece of casting in the film has to be Tilda Swinton who plays an ominous bureaucratic adult figure known only as ‘Social Services’ who is desperate to split up the two young lovers. A delight from start to finish, this film sounds looks and fells like the 60’s and brings a rush of nostalgia over first love. 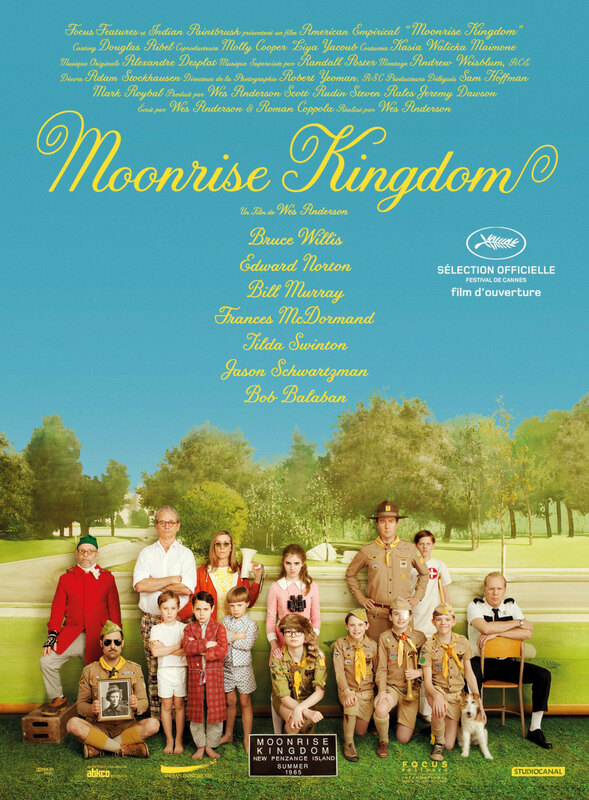 Brilliantly acted, written and directed Wes Anderson’s Moonrise Kingdom is the indie film of 2012 and an utter joy to watch.